At Missing People we are a light in the darkness: for families in the agony of missing a loved one; for children, scared and alone; for people adrift, on the edge of despair. We all know what it feels like to wake in the darkest watches of the night, when our deepest fears and worst nightmares claim us. 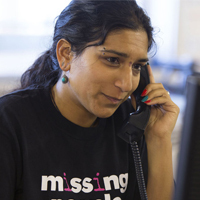 As you know the Crisis team at Missing People are there to help day and night. I want to share with you examples of some real situations where we have helped through one night. Names have been changed to respect confidentiality. 9:45pm Tracy calls in from Luton. Tracy’s adult son disappeared just before Christmas two years ago. We have been supporting Tracy since then. There is no proof of life but no body either. We stay with Tracy, listening and supporting her for over an hour. 11:13pm A woman calls. She speaks at length about the deaths of her mother and sister, about being raped by her brother-in-law PAUSE. About her own health issues. She tells us that she has previously attempted suicide by overdose and cutting. We urgently signpost her to local counselling services to get the help she needs. Later, we will receive a text from her thanking the Crisis Worker for her support. 12:55am A call comes in from a 15 year old girl in Surrey. Carol received a text message from us when she was reported missing. She is tearful and scared and discloses that she was raped when she was 13. She’s frightened it might happen again. Carol tells us that she’s been drinking with some older mates, has smoked cannabis and taken cocaine. We arrange a 3-way call with Police and both the Police officer and Missing People stay on the line with her until Police arrive to make her safe. At 2:30am We take a call from Mary, whose partner is missing. Mary has difficulty sleeping and eating and she is tearful/crying for much of the call. Her partner left a note before she left. It simply said, “I’m sorry. I can’t go on.” Mary talks through the maelstrom of emotions she is feeling right now. We’re there for her. Since the shift began, texts have been coming in from a 16 year old who says she is feeling suicidal, that she is thinking of self harming, that she has cut herself in the past. Throughout the shift, we continue this text conversation, encouraging her to keep in touch and to stay safe. At 4:00am we receive a call from Jade. Jade is 21 and has run away from a Mental Health Unit at a hospital. Jade is having hallucinations and says she wants to jump off a bridge. Thanks to the skill of the Crisis Worker Jade lets us call the hospital. We stay talking with Jade while she waits to be taken to safety. Early evening – We made a support call to a mum in London with a high risk missing daughter who’d been gone for over 24 hours and had left a suicide note. Mum was grateful to talk about how her beautiful daughter had gone from having a good job into drug addiction. As we were talking, the missing girl came home! She was distressed so I agreed to call back to offer our Aftercare service. Mid evening – a Helpline volunteer took a call from a 16-year-old in Exeter who’d got a Textsafe message from us on his mobile. He’d overdosed and was very upset. We gently supported him and thankfully he agreed to us calling an ambulance. We stayed talking to him, ‘holding his hand’ from nearly 200 miles away. At this very moment, members of the Crisis Team are at the Charity being a beacon of light in the darkness but we cannot continue our work without your generous help and support. Please give what you can tonight to keep that light burning. Thank you.